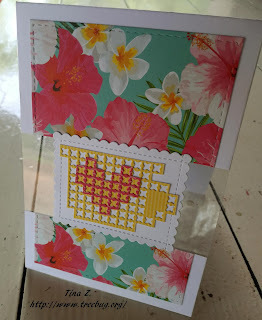 As you like it - Favourite: Flora or Fauna (and why) I just love making cards with colourful tropical flowers, I adore them. Jo's Scrap Shack - FFC #236 Always Anything Goes with Sunny Studio Stamps! A wonderfull last card for the Coffee Lovers blog hop Tina. Congrats on being the last one!! Such a cute card. Great coffee card being the last entry! So cute! A beautiful finish to the hop. I love your card. Yay! You're the final entry...thanks for wrapping up the hop with this beautiful design! This is adorable, Tina. I love how the coffee cup looks like needlework. Adorable! Beautiful last entry. I love the way you have the cross stitched cup on an acetate panel. It makes for a stunning card. Pretty card. Fun cute x stitch design. What beautiful summery colours on your background and my goodness your coffee cup is just perfect. Hugs Mrs A. SO very pretty! Love the papers and that fantastic cup! Tud jaz nisem takoj videla skodelice... Super. Zanimiva. Kava v raju. :-) Lepa voščilnica.